Please note that the list is alphabetical and the presence of something on the list does not mean it will be done. I plan to release the list of items to be included in the next build separately. It also does not include any Bugs since these by definition will be worked on. Note also the minimap displays bookmarked locations and a black box showing your current view area in the airport. The box is a bit hard to see tho so maybe just an icon centered on your current position. Also the minimap display size defaults to the background image size, but a custom size (or just zoom level?) would have to be available too because without a background image not sure how you would determine the size of the airport to have it all appear at once in the window. I like that idea. This would definately save some time. GUID, followed by the name. Is there a reason that this file is not used by ADE when loading a library BGL into LOM? That would make it much easier to use this function. Tom - good idea. My old LOM did just that. There are several items on the list that cover this area: 10077, 10269 and 10131. Thanks, that would be very convenient. BTW, I can't find 10077 in the list. I saw the other two, but since I didn't see this feature listed I thought I would add it specifically. what about a background layer for google or bing aerial images like in ModelConverterX? Maybe Arno could provide his code? I wonder that nobody else is begging for that feature? Holy Mother! That's a long list. And this is after your new release?! User is working on an airport that blends nicely into the 3rd party mesh at one end of the runway (the proper airport elevation), but has a plateau on the opposite end of the runway. 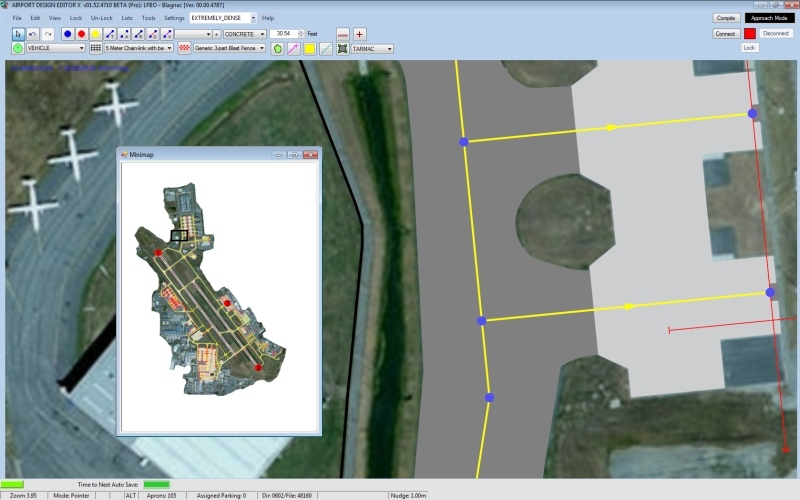 Allow the user to set his aircraft on the ground out as far as he wants from the airport. In slew mode, with the 3rd party mesh active, the user moves the aircraft in a circle (or whatever pattern), around the airport. Points of elevation are collected automatically as the aircraft moves. When the aircraft completes is circle, a sloping poly is created using those points as the outer parameter and moving upwards to meet up to the airport's elevation. Just thought I would throw that out as I try to smooth out KPSP with MegaScenery Earth SoCal, ha! I have always wondered about the display grid sizing and placement, now I know after reading the release notes for 1.55. Would it not be beneficial in placing background images to have the display grid aligned with lat/lon? A hotkey (spacebar?) to select the pointer tool would be nice. The button is waaayyy up there in the corner, so far from where the work gets done. Keep up the good work and thanks for gving us this great tool. George Davison aka "Golf-HotelDelta" here at FSDev has already developed a proprietary workflow to do this, which IIRC, he has made available for use by the UK2000 team for correcting terrain integration issues at payware airports they release for FSX. Perhaps he could consult on how this might also be done via the ADE GUI ? Hit Esc to get the point tool at any time. Good to know, must have missed that one in the manual. Not harsh at all. While I do not turn the grid off, it has never been of much value to me other than as a reminder that I have rotated the display. At one time I was trying to place an FAA airport chart (which have lat/lon lines on them) as a background image and thought it would be helpful in lining it up if the grid represented actual lines of lat/lon. I ended up creating a pseudo-grid with guidelines and placing them on lat/lon lines that corresponded with the chart. It took a bit of fussing and got the job done. How about an option to select dashed center lines for the vehicle paths? If FSX would honor that???? Perhaps 10154 could be extended to provide a measure to position the "T" offsets and indicate the position of pushback tractors.